War deaths in Syria now top 100,000. 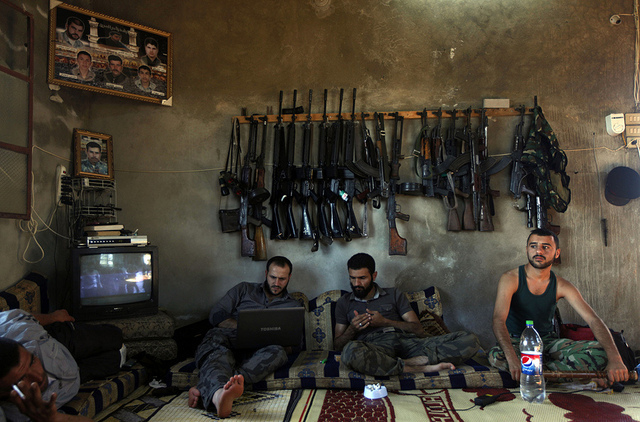 The US plans to begin directly supplying arms to the opposition force within the month. Experts say that sarin gas use in Syria still cannot be genuinely proved, since the process can’t control for tampering. Fighting between rival armed militias in Libya’s capital have killed five and wounded nearly 100. Monday saw Israeli air strikes carried out against Gaza in retaliation for Palestinian rocket fire. At least 16 Lebanese soldiers were killed in fighting with Sunni militants in Sidon. A series of bomb attacks in Iraq on Monday killed at least 42. A Taliban attack on Kabul has put peace talks on edge. The annual report (PDF) from the UN Office on Drugs and Crime shows Afghanistan remains the world leader in opium cultivation and production. Pakistan’s former leader Pervez Musharraf’s treason trial has been adjourned indefinitely and a four-member committee has been created to probe treason charges. A video of two Czech women captured in Balochistan a couple of months ago surfaced, along with demands by their unidentified captors, that neuroscientist Aafia Siddiqui be released by the US. It has not been verified. Head of NGO For Human Rights, Lev Ponomaryov, was forcibly evicted from his offices along with staff and beaten by Russian law enforcement. China will send peacekeeping troops to Mali. HRW says that China has resettled 2 million Tibetans over the past seven years. Violence and rioting in the Western region of Xinjiang left 27 dead. In response to US threats to end trade benefits over Snowden, Ecuador waived the benefits and offered the US $23 million worth of human rights training. Protesters continued to take to the streets in Brazil, facing off against police. Dzokhar Tsarnaev has been formally charged with killing four people and using a weapon of mass destruction. Marine Gen. James Cartwright, formerly the vice Chair of the Joint Chiefs of Staff, is apparently the target of a DOJ leak investigation regarding information leaked about Stuxnet. A new Guardian scoop revealed that the Bush administration email record collection continued for two years under the Obama administration. The administration insists anyway, that Bush era data collection ended in 2011, but as The Guardian went on to report, massive metadata mining continues through the program EvilOlive (what?). Here’s a pdf of a 2009 draft report of the NSA inspector general regarding the surveillance program, thanks to The Guardian. Leaks also reveal massive online data collection by the British counterpart to the NSA, the GCHQ, of information obtained by tapping fibre-optics cables. The info is shared with the US. The Army is restricting access to The Guardian’s website in an Armywide filter. McClatchy on how memories of Stasi affect Germans’ views of US surveillance practices. Glenn Greenwald addresses attempts to smear his reputation and attack his work. David Carr and Jay Rosen both came to his aid earlier this week. The Snowden leaks have brought WikiLeaks back into the news. A CIA inspector general’s report (PDF) reveals there have been four CIA embeds with the NYPD since 9/11 and raises questions about the limitations they had, the assistance they offered, and the relationship between the two organizations. Former US National Coordinator for Security, Infrastructure Protection, and Counter-terrorism Richard Clarke rather astonishingly acknowledged to the Huffington Post that the circumstances of Michael Hastings’ crash were “consistent with a car cyber attack.” He was careful to say that he was not saying he thought there had been such an attack. The Daily Beast profiles the life and work of incoming deputy director of the CIA, Avril Haines. A video interview with journalist and Dirty Wars author Jeremy Scahill on national security oversight, whistleblowers and the effect of surveillance on journalists and journalism. A military court overturned a Marine’s conviction in the murder of a retired Iraqi policeman because Sgt. Hutchins was held in solitary confinement without access to a lawyer. The Army plans to cut 12 combat brigades and reduce force size by 80,000. As U.S. Deploys Patriot Missiles and F-16s to Jordan, Could Syrian Conflict Engulf the Middle East? 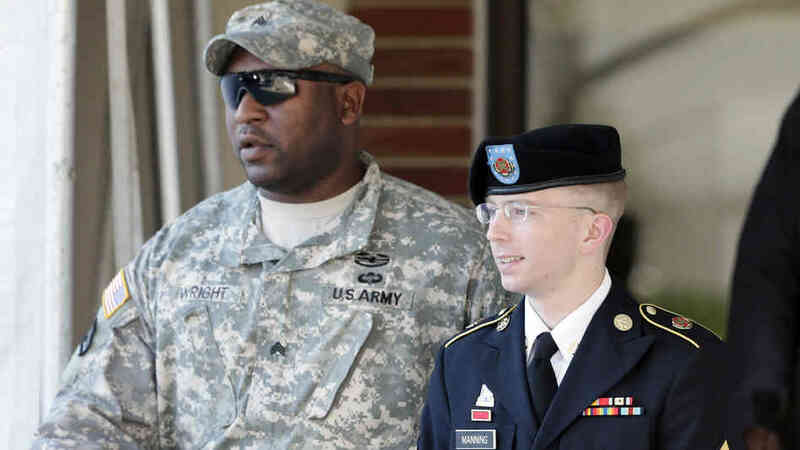 Photo: Accused WikiLeak Source Bradley Manning. This round-up will be on hiatus the next two weeks (sorry), but will return! Fierce fighting is ongoing in the Syrian town of Qusair. Palestinians are delaying joining UN agencies, conventions and treaties in order to preserve the current peace effort. A former Israeli border policeman killed himself and four others in a bank in Beersheba after being refused an overdraft and cash by an ATM. Multiple days of clashes between Sunni and Alawite residents in Tripoli, Lebanon have left at least 11 dead. Rami Khouri asks if Hezbollah is at a turning point. Yemenis in the southern city of Aden rallied in support of an independent south. Six Egyptian policemen and a border guard who were abducted on the Sinai peninsula last week have been released by their captors, who remain unknown. In Tunisia, 200 Islamist protesters were arrested and one killed in clashes with security. Karim Mezran at The Atlantic Council worries that Algeria is a powder keg. 300,000 people have been displaced by fighting in the Darfur region this year. 18 soldiers and four Islamists were killed in a gun battle in Agadex, Niger. M23 rebels in the Congo have declared a ceasefire for the UN Secretary General’s visit. With the executions of five Yemenis, the total number executed in Saudi Arabia this year is 47. A wave of car bombings across Iraq on late Sunday and early Monday left 76 dead and 250 injured and on Tuesday explosions in Baghdad, Kirkuk, Tarmiyah and Tuz Khurmato added at least another 23 to the death toll. Iranian presidential candidates Esfandiar Rahim Mashaei, a former Ahmadinejad aide, and former president Ali Akbar Hashemi Rafsanjani have been disqualified from elections. Iran executed by hanging two men accused and convicted of spying for the CIA and the Israeli Mossad. Kim Jong-un sent an envoy to China. North Korea reportedly has a new military chief. The drug war is ramping up in the Mexican state of Michoácan. Guatemala’s top court threw out former leader Efrain Rios Montt’s genocide and crimes against humanity convictions. Guantánamo’s WiFi was shut off after the hacker collective Anonymous threatened disruption at the base. The transcript for President Obama’s speech on drone policy and Guantánamo Bay is in full here. Prior to the speech Attorney General Eric Holder publicly acknowledged what was already known: the US had killed Americans abroad with the drone program (four, to be specific). The US State Dept’s annual International Religious Freedom Report found discrimination and bigotry against Muslims and Jews on the rise around the world [PDF]. A former friend of Boston bombing suspect Tamerlan Tsarnaev, Ibragim Todashev, implicated Tsarnaev in a 2011 triple murder and then was himself killed when he reportedly attacked FBI agents during questioning. The word terrorism is being used to describe a brutal attack on a London street that left a British soldier dead. One of the attackers recorded a video statement directly following the murder. One attacker has now been identified as Michael Adebolajo, and has been connected on some level to the extremist group al-Muhajiroun. The University of Kent has created a Rendition Flights Database, cataloging 11,000 individual flights to create a picture of the global renditions network. The humanitarian disaster in Syria is mostly ignored as external powers vie for position to control outcome of civil war.